We are glad to announce and invite entries from Fibromyalgia Warriors for the third year of our Valentine's Month contest. 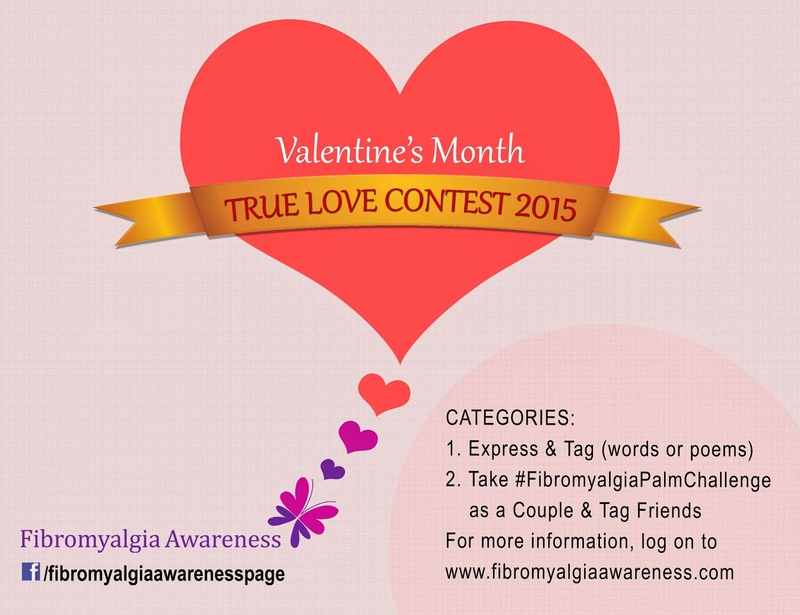 The True Love Contest 2015 is a lovely contest just for those who have Fibromyalgia! How we love the season of love! And while a few of us are struggling to make our near ones understand us, some are fortunate to have someone who really understands and cares. So this season of love, how about surprising those who give us the strength to go on! It's tough for a person to deal with a loved one's chronic pain, inability to do some many things, mood swings and all the symptoms. Yet, they become our support system, our strength. We feel low so many times but we know they are there for us and we hold on to that good thought. We keep going with the power of that love. So take a few minutes and express your love and gratitude to the ones who care! Tell the person/s how much you appreciate and love them for all that they do for you. Only members of our Facebook page, who have fibromyalgia, can participate. Comment with your entry on the Pinned (topmost) post about this contest on our Facebook page. Also mention your location (City, State, Country) and name the person who you dedicate your entry to. Share our Facebook post about the contest. Only one fresh and original entry per category is allowed per participant. For selection of winners, we shall consider your entry post / Palm Challenge photo, number of people you tag, the likes on your entry (i.e. your comment post) and the shares you get. The contest will be judged by the Fibromyalgia Awareness Team. ENTRY DEADLINE: We would appreciate if you submit your entry on / before 14th February to make the day more magical. However, you can add your entries until 28th February 2014, 9 pm (IST). You can check the corresponding time in your time zone here. We will go through the entries and publish all of them on our blog www.fibromyalgiaawareness.com. You can share this blog link then with your special person and on your social media sites for the world to see! The winners will be announced on our Facebook, Twitter and Instagram pages as well as on this blog. A special winner's poster will be created and posted on our Facebook page for each of the winners, who can share / download it! The winners of both the categories will be featured on the home page of our blog for a month. Runners-up in each category (based on the number of entries) will be featured on the blog until mid March. And if we manage to get some sponsors for prizes, we would be more than happy to have some giveaways!!! So hurry up... pen your thoughts now and then spend a lovely Valentine's Day and Month!! Hugs! If you have any queries, you can ask in the comments section below this post.